Sanford City Hall is located at 225 East Weatherspoon Street, Sanford, NC 27331; phone: 919-775-8202. Photo: John D. McIver House and Farm, ca. 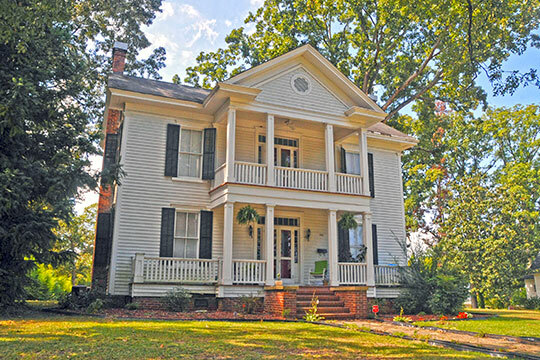 1855, 2007 Windmill Drive, Sanford, NC. Listed on the National Register of Historic Places in 1993. Part of the Lee County NC, Multiple Property Resource. Photographed by user:Jerrye and Roy Klotz, MD, 2007, (own work) [cc-by-3.0 (creativecommons.org/licenses/by/3.0)], via Wikimedia Commons, accessed April, 2016. Sanford is located in the central Piedmont area of North Carolina, occupying the gently rolling hills of the state, which are flanked on each side by the mountain region of the west and the coastal area of the east. Several rivers and streams lace the region, providing opportunities for successful cash crops (primarily tobacco) and recreational facilities for activities such as water skiing, camping, and hiking. Since its incorporation in 1874, Sanford has been an active railroad and industrial center, known as one of the nation's largest producers of brick and pottery products. In 1868, Colonel C. O. Sanford, a New York-born civil engineer, arrived in North Carolina to supervise construction of a railroad line that ran through Chatham County and formed a part of the Raleigh and Augusta Air Line (now the Seaboard Coastline Railroad). During his tenure with the railroad, the line was extended, in 1872, from Raleigh south to Hamlet, crossing the Western Railroad line just to the northwest of Jonesboro (now Jonesboro Heights). This intersection of two rail lines was a natural environment for the development of a community, a phenomenon repeated across the state and nation throughout the second half of the 19th century. This particular crossroads is said to have been named in honor of the man who was instrumental in creating the climate for its development. A small town quickly began to develop at the crossroads, with two small hotels and several stores commencing operation almost immediately. Major John W. Scott, who owned much of the land on which the central area of Sanford arose, was most influential in determining the physical layout of the town. Scott secured the services of an engineer and U. S. Military Academy graduate, one Major Whitford, to survey and draw up the plan for the new town. Scott also is said to have donated several lots where the first school building and several churches were built. The first depot agent was W. T. Tucker, for whom the structure now known as the Railroad House was built by the company. This building, in which Mrs. Tucker operated a school, is believed to be the oldest surviving house in Sanford. Mr. Tucker was very active in securing the town's charter (1874) and was appointed as its first mayor in the same year. With the town's incorporation in 1874 and the success of the railroads adding needed stability, Sanford grew quickly as several small manufacturing concerns, principally saw, corn and flour mills and cotton gins, were established. Along with numerous small commercial enterprises, they contributed to the expanding industrial and economic diversity of the area. In particular, the town began to develop as a major trade center for the surrounding area, as evidenced by the rapid increase in the number of businesses operating locally. The 1878 North Carolina Business Directory, edited by Reverend Levi Branson listed eight merchants, most of whom ran stores offering general merchandise. Within twelve years, this number had increased to thirty-one, with much greater diversification and specialization of services and goods offered; during this period, the town's population grew from 236 in 1880 to 450 in 1890 and 700 in 1896. Mary Ellen Bowen, Executive Director, Downtown Sanford Redevelopment Corp. and Allison Black, Survey Specialist, North Carolina Division of Archives and History, Downtown Sanford Historic District, Lee County, NC, nomination document, 1984, National Park Service, National Register of Historic Places, Washington, D.C.